New Delhi: As conflicts over land and development spread across India, it doesn’t hurt to have a Gandhi on your side. The promoters of Deccan Gold Mines Ltd (DGML), a publicly traded mineral exploration company, and its associate, mining firm Geomysore Services (India) Pvt. Ltd, have tapped Tushar Gandhi, the great-grandson of Mahatma Gandhi, to aid in community development for people living in mineral-bearing areas. The strategy seeks to avoid repeats of Singur, the controversial site of Tata Motors Ltd’s Rs1 lakh car factory, or even the May kidnapping of Posco-India executives in Dhinkia, Orissa. Some firms are offering local residents jobs or a stake in their profits, along side promises to improve infrastructure and local institutions. In DGML’s case, the company’s chairman Charles E.E. Devenish plans to put his personal money into the Australian Indian Rural Development Foundation (AIRDF) to launch a series of rural programmes based on the Gandhian model of self-reliant “village republics", specifically in areas where Deccan has applied for mines. Tushar Gandhi will work with AIRDF to implement these programmes. He will be paid a salary for his services, but neither party disclosed the details. Geomysore says it has committed Rs60,000 monthly for the project. 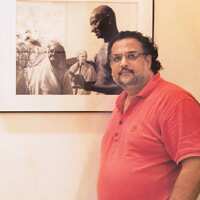 On Mahatma Gandhi’s birth anniversary on 2 October, Tushar Gandhi said worshipping the Mahatma has become more ritualistic, his message forgotten after the date is over. “What is needed is to turn this worship into actual work in the spirit of trusteeship," says the founder of the Mahatma Gandhi Foundation, which has been compiling a digital archive of the leader’s writings, photos and speeches. Geomysore is 80% owned by Perth-based Australian Indian Resources Pty. Ltd (AIR), with the balance being held by Cyprus-based Sun Mining and Exploration Ltd. DGML is 58% owned by Rama Mines (Mauritius) Ltd, in turn promoted by shareholders of AIR. DGML’s 100% subsidiary, Indophil Resources Exploration Services Pvt. Ltd, is prospecting for gold in Kerala, Andhra Pradesh and Karnataka. Geomysore is prospecting in Jonnagiri, located in western Andhra Pradesh. AIRDF plans to build 20 toilets at a cost of Rs10 lakh for the Jonnagiri high school, where some 600 students attend, but not a single toilet exists. It has plans to promote more teacher training and support horticulture projects, such as the planting of macadamia trees. Already, 800 macadamia nut seeds imported from Australia are in plant trials in Nandi hills, 40km from Bangalore. Some of the plants were also flown to a garden in Dimapur, Nagaland, where a Geomysore arm, Trident Mineral Exploration, is seeking licences to explore nickel and platinum deposits near the Indo-Myanmar border. Some varieties of macadamia are edible, and its oil can be used in cosmetics. “Every mining deal has to be win-win for everybody. What we need is a Marshall Plan mentality to start the first stage of development for cash flows from mines to create economic ripples," says Devenish, referring to the US-sponsored aid programme to help rebuild Europe after World War II. Devenish, also a stakeholder in Geomysore, first heard of Mahatma Gandhi while studying at the progressive Bedales School in England as a teenager and says he undertook a trek on foot from Calais in France to Kolkata in 1958 when he was just 17. Miners have faced an uphill battle in winning over local communities. Unrest is spreading from the beaches of Kerala to Orissa’s bauxite mines, where Sterlite Industries Ltd has been accused of illegally diverting forest land. Environmentalists say a majority of the country’s mines, mostly run by government agencies, have a poor record of closure with negligible reforestation efforts. “The whole aim of mining is profiteering today, which goes into feeding corrupt practices. Many of the licences take a long time to come, so when they get the mines, it’s an opportunity to get back all that they had spent," says Gandhi, 47, who came under fire in India for attempting to sell copyrights of his great-grandfather’s works and images to US-based CMG Worldwide. Public outrage forced cancellation of a deal to use the Mahatma’s image in a credit-card advertisement. Activists say mining officials tend to be insensitive in handling displacement and do not give landowners the compensations due. Consequences of displacement have turned violent in places such as Kalinganagar in Orissa and Nandigram in West Bengal. Companies such as JSW Steel Ltd—investing Rs40,000 crore in a steel mill 200km away from Singur—dole out hefty compensation packages. One component made some 742 villagers stakeholders in the project. “Farmers have lived for generations on the land. It is something more deep-rooted than money," says Biswadip Gupta, chief executive officer of JSW Bengal, JSW Steel’s subsidiary handling the West Bengal project. With increased awareness of their fundamental rights, a farmer today behaves like a venture capitalist, says Satish Magar, managing director of Magarpatta Township Development and Construction Co. Ltd. “Instead of bringing money, they bring land." A former land owner himself, Magar convinced 125 other families to pool in land near Pune to build a township in return for stakes in the company several years ago. But sceptical activists continue to distrust efforts by companies to put a positive spin to displacement. Some 600km away from Jonnagiri, claim activists of Mines, Minerals & People (MM&P), a network of 150 organizations, protestors have formed blockades at JSW Steel’s proposed site for an aluminium refinery in Boddavara. And at Makavaripalem, also in Andhra Pradesh, a hunger strike has been waged for the past month to protest against a second aluminium refinery in Andhra Pradesh—the project of the government of Ras Al Khaimah, one of the seven emirates that form the United Arab Emirates. Makavaripalem is also the location of a special economic zone. “We have heard promises of farmers getting macadamia plants before," says Ravi Rebbapragada, coordinator of MM&P. “So far, all these promises have been false and farmers have always been tricked into giving up their land. Ultimately, companies have to give people their due share," Rebbapragada adds.